With oil prices down 50% since Fall 2014, state revenue agencies are seeking ways to overcome the shortfall without increasing taxes. The simplest answer is improved enforcement: discovery, lead development, audit and collections are key aspects of that. The IRS’s IRMF data by state payee from 1099K filings is a good start if you haven’t done so already, but the facts of this article may have potential in areas where the 1099K data falls short. The very weakness the IRS was trying to root out still cannot upstage the cash economy. This is no less evident than on the free online classifieds site Craigslist. Perennially one of the top 10 sites in the USA, it should command a lot of attention for a tax gap. For example, read about the $617M/year auto parts recycling market or the $17B/year used motor vehicles marketplace – all individuals portraying “private sellers” in what’s really an underground cash-based enterprise. Facebook recently announced they have over 25 million small business Pages that are actively maintained. Some self-employed professionals who work from home have found a way to exploit social media to their advantage. Services like skilled trades, hair styling, mobile automotive repairs, website creation, proof-reading, graphic design require very little capital investment to start up, and many entrepreneurs start it off as a part-time hobby. It later mushrooms into a living for them, but they may forget to pay their taxes along the way. None of these transactions are ever recorded because they are the cash economy. But it’s a little different than in #1 because the professional can operate above-board and do not intend to mis-represent themselves to her customers. The cutoff threshold for 1099K reporting is 200 transactions AND $20,000 per year gross. This is missing out on a critical secondary income stream, which are vacation rentals. Many individuals can use the vacation rental as a write-off for their income tax, but at the state/municipal level, they might have a tourism occupancy tax, hotel tax, or bed tax which is independent of other taxes. So it may not be as important to IRS as it is for states and localities. 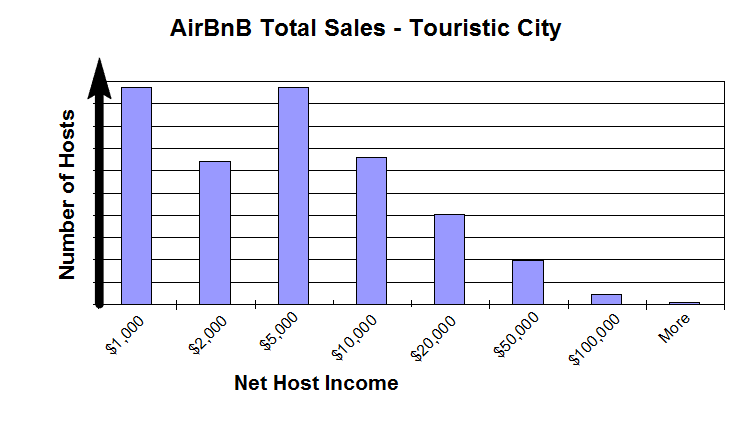 Below is a practical graphic illustrating the income histogram of vacation rentals in a popular US tourism destination. You’ll see that the sweet spot is right between $5,000 – $20,000, just below the reporting cutoff. Secondly, you’d be hard pressed to find a vacation rental on any of the sites where you’ll reach the 200 transactions per year threshold. Many hosts require a minimum 3-day stay and there are only 365 days in the year. According to current e-commerce / sales tax case law, a business must have a physical presence in each state to be required to collect sales tax. Well a fulfillment center definitely meets the criteria, and guess what? Because the IRMF data is based on the state payee, the IRS takes that to be the corporate headquarters of the payee, and not the location of the fulfillment center. So if you have a Los Angeles-headquartered business with TX, NC, IL and FL fulfillment centers, then only California gets the 1099K data. In a recent eBay sample data set of 31,000 businesses that were located in California, about 600 of them had at least one other location. Whether that was the corp. HQ or a fulfillment center isn’t clear, but in fact a large percentage of those multi-location sellers were some of the higher revenue generating businesses on eBay. 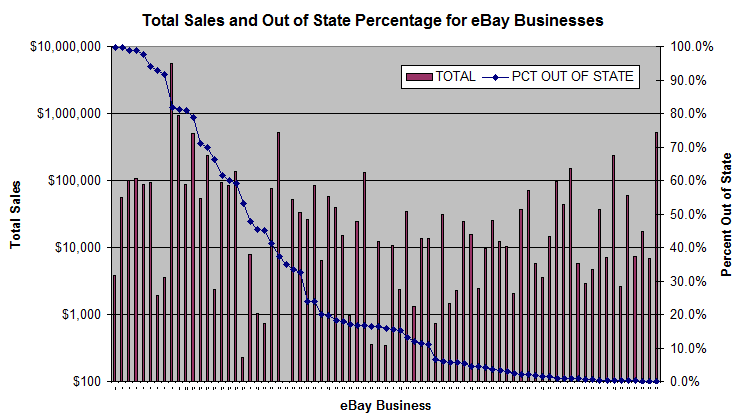 Consider the graph below with Out-of-State Percent and Total sales for a sample of 77 California-based eBay businesses. About 20 of those businesses have 50% or more of their revenues based on the non-California location, and 12 of them have close to or more than $100,000/year of sales. A recent OECD white paper estimated the worldwide effect of electronic sales tax suppression schemes into the tens of billions. These sophisticated software packages that are installed by the business owner on Point-of-Sale systems allows him/her to make a specified percentage of sales vanish at the end of each day. Inventory counts and other POS parameters are also adjusted to account for the vacuum on the books. Some jurisdictions have even invested $170M+ just to stay ahead of the suppression techniques in the restaurant and other high-cash based industries. The rise of the virtual currency has arisen by the need for a direct buyer-to-seller transaction to occur without a middle-man: a bank, an ACH or a pesky government in the way. BitCoin is undoubtedly the most well known of the virtual currencies out there. Don’t look now but it has gained a widespread acceptance with Microsoft, Dell, Overstock, Expedia, Shopify. However, it appears intermediaries like CoinBase or BitPay immediately convert it into currency for those big e-commerce sites. So it isn’t those e-commerce sites that need to be reviewed, it’s the intermediaries which require scrutiny. Given the high fluctuations of the BTC:USD exchange rate, it’s worth paying attention to ensure that those exchanges are correctly transacted by those intermediary payment providers.